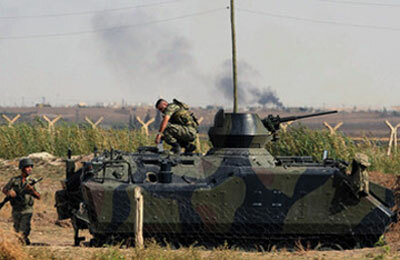 The Turkish military returned fire after a mortar bomb shot from Syria landed in countryside in southern Turkey on Saturday, the state-run Anatolian news agency reported. The strikes and counter-strikes have been the most serious cross-border violence seen so far in Syria's conflict, and underlined how it could destabilize the region. Turkish Prime Minister Tayyip Erdogan said on Friday his country did not want war but warned Syria not to make a "fatal mistake" by testing its resolve. Damascus has said the mortars landed in Turkey accidentally. "Military units on the Turkish border launched retaliatory fire immediately," the agency said, without identifying its source or mentioning any casualties. In a belligerent speech to a crowd in Istanbul on Friday, Erdogan had warned Syrian President Bashar al-Assad that Turkey would not shy away from war if provoked. "We are not interested in war, but we're not far from war either. This nation has come to where it is today having gone through intercontinental wars," Erdogan said in his speech. "Those who attempt to test Turkey's deterrence, its decisiveness, its capacity, I say here they are making a fatal mistake."